I finally made a LO using a bracket thingy - they are everywhere in the galleries and so I had to use a template to get inspired, but I did it! I also don't think I've ever done a LO just using two colors - it almost seems Valentine's Dayish, but I wanted to use some of my next kit I'm working on to make sure it would work for LOs. I always start these things with one idea and then they just seem to morph into something a little different. This was a good test, even though its a simple LO, I'm going to go back and add a few things to the kit. 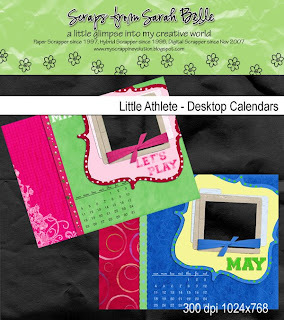 I did another little test with the kit - I made some desktop calendars. I had hoped to get these done before May 1st, but my kids had other plans. There is so much more than is showcased in these two desktops - but still a little more to complete before I roll it out. great job, sarah! so cute! i think i'm the first one to download this hehehehe. i think this will be the perfect gift for the grandparents!!! thank yoU! I didn't see a place to comment in 4shared. But I picked up that pink calendar for my desktop! thanks so much for your generosity.